“If I wasn’t gaming, I was thinking about gaming”. Sean – not his real name – has told the BBC’s Victoria Derbyshire programme about how gaming addiction took over his life to the point where he lost his family and his job. Matthew Preece, a senior therapist at the UK Addiction Treatment group (Ukat), says there has been a “significant” increase in the number of people seeking treatment. The group, which has traditionally treated people for alcohol, drug and gambling problems, says that it has seen the number of people wanting help with gaming addiction rise year-on-year from four in 2014 to 22 in 2018. Sean was one person who became addicted. He was hooked on first-person shooter games – on one occasion spending a solid 48 hours in front of his computer. “It just consumed me. At my absolute worst, I was gaming all day, every day,” he recalls. “My children were like an inconvenience because they wanted my time, and I wasn’t able to give them my time and my love. The worse things became with Sean’s family, the more he retreated into gaming. “I was being late into work, and it consumed my life to the point where I lost my job,” he explains. Sean knew he had to change, and eventually checked into rehab – spending a month in treatment. He has relapsed a few times since, but says he has been on track for the last 14 months. The urge to play, he explains, “never goes away”. 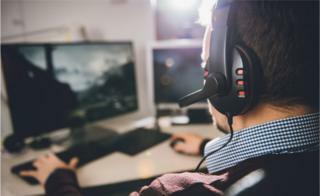 Experts say that spending hours playing video games in itself is not a problem, but that it can become one when it gets in the way of life – with negative consequences. Last year, gaming addiction was listed as a mental health condition for the first time by the World Health Organization. On the NHS, there is not currently any specialised treatment for gaming disorder. Plans to run a pilot NHS gaming clinic in London have been delayed by ethics approval. Central and North West London Foundation Trust said it was hopeful that the plans would resume in future. Ukat says that an increasing number of people are turning to the private sector for help with gaming. Mr Preece believes the accessibility of games on tablets and mobile phones is a major driving force. Several other treatment providers have also told the Victoria Derbyshire programme they have seen a rise in cases of gaming addiction. Harley Street addiction therapist Adam Cox says he now typically sees several individuals each month. One of his clients, 18-year-old Liliana – not her real name – told him that playing online video games on her phone had taken over her life since she began six months ago. She described feeling “embarrassed and ashamed”, having isolated herself from friends and family to stay in her bedroom. “Most days I’ll be really tired from staying up late on the game,” she said. “And because I’m tired, I’ll be in a very bad mood, and I won’t be able to concentrate. During her session, Mr Cox told Liliana that her addiction was likely to stem from the lack of “challenge and relaxation” in the rest of her life. And he asked her to take an important step and delete the games, so that she has to go through a longer process to reinstall them should she be tempted. Three weeks later, she said she had not played the games. Instead, she had been practising some of the techniques that Mr Cox taught her, like thinking about what experiences away from gaming she was missing out on. “I just feel like I don’t need to waste my time, and there is lots of stuff I can be doing,” she said.